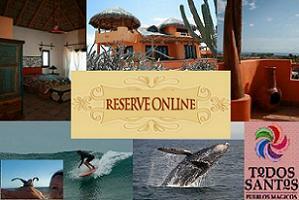 The Hotel California in Todos Santos, Baja California Sur, captures an image that everyone wants to, well, own. Writing credits for the song are shared by the group’s three main songwriters: Don Henley, Glenn Frey and Don Felder. On the original album it states “copyright in dispute”. The Copyright Office has verified that a compulsory license was used and there is underlying music, which means that the song cannot be played on jukeboxes, in marching bands, in karaoke, or in stage productions. The amount of underlying music used and original source remain a mystery of rock with great speculation. For years people have debated whether the Hotel California in Todos Santos is one in the same as the song. 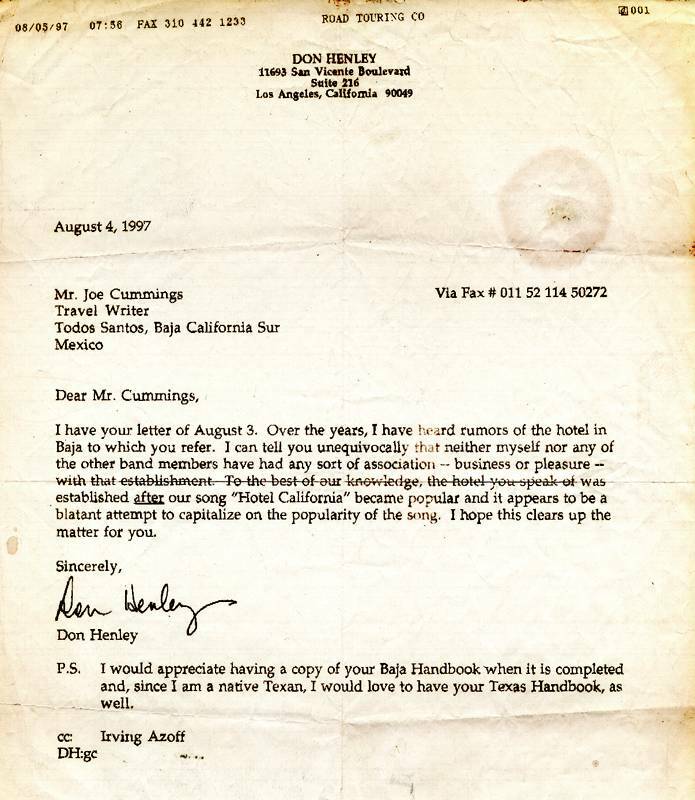 In 1997 Don Henley sent Joe Cummings, a travel writer in Todos Santos, a fax in which he stated “unequivocally that neither [he] nor any of the other band members have had any sort of association — business or pleasure — with that establishment.” A copy of the fax is below. 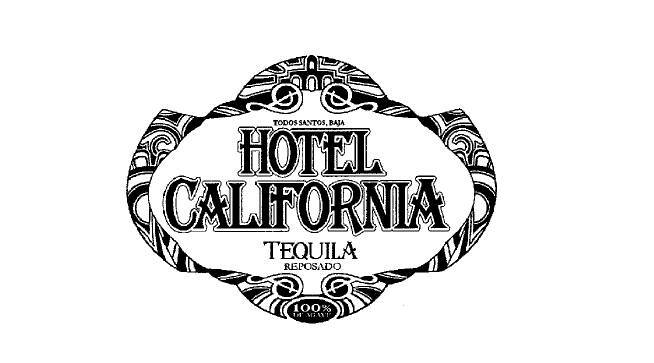 The nexus between Todos Santos, the Hotel California, Tequila Sunrise and the Eagles seems to have just been preserved for history, however, as the Hotel California has been granted a US trademark for the right to use the mark “The Hotel California” on a private label tequila (currently being offered as “rare” on eBay for $150). The tequila has been described as “a hand crafted premium reposado tequila with time honored traditions.” The owners have secured a piece of the secret recipe and by attaching it to a hotel and tequila from Mexico will ensure the mystery (and speculation of association with Satanism or a Psychiatric ward) will live on (incidentally, disproven here by Snopes http://www.snopes.com/music/songs/hotel.asp). All too complicated for me! I think I’ll have another Tequila Sunrise — Hotel California Style! They admittedly have built a pretty cool website at www.tastethelegend.com or http://www.hotelcaliforniatequilausa.com/ Here’s the image from the trademark application. The link to the complete application is here. Here’s a video that makes me want to take a shot now, even though it’s well before noon.